Here at Resorts Direct we try to cater for everyone's needs. We work with all different types of accommodation, from hotels, apartments to villas. We work with all standards of resorts from 3*-5* with rooms sleeping 2-6 people. Our organisation is heavily driven towards making our clients booking procedures as easy as possible, hence the creation of our To Be Arranged system, otherwise known as a "TBA". The "TBA" was designed for the modern family of today who may not be able to decide their dates and destinations desired for their holidays on the spot. This service gives clients the ability to take advantage of our special offers that are held at different stages, with the flexibility to be able to specify the exact date and destination at the clients leisure. Firstly our representative would take your booking details from you which will then be sent to our reservations and administration team. You will then have a full confirmation sent to you via email within 24hours with a follow up confirmation being sent through the post which generally takes between 7-10 days to arrive at your door step. The confirmation will have your unique personal reference number which is what is used when making a booking. Your documentation will state how many weeks that you have purchased and the date that they must be used by. Our reservations team consists of over 50 representatives that are trained to search for the best resorts that will be the most appropriate for you and your families requirements. To try and guarantee the exact holiday that you want, we ask that you provide the most amount of notice that you can. The "TBA" facility enables clients to choose any date desired throughout the year. This means that you can travel during low season or high season (including school holidays). This makes the "TBA" perfect for couples or families and suits even the busiest peoples lifestyle to guarantee the easiest booking process possible. We look forward to sending you a full confirmation through the post so that we can get your holiday experience started and give you all something to look forward to! Golden Sands Resort & Spa, Malta is a beachside resort with panoramic views over the Mediterranean coastline that reflects the warm charm and character of Malta. The resort is ideally located to p more..
Set on Playa de la Arenas seafront promenade, Hotel Bahia Flamingo features an outdoor swimming pool and a restaurant. Just 350 m from the beach, it offers easy access to the resorts cafes, bars a more.. This comfortable apartment complex is situated in the southwest of Tenerife. 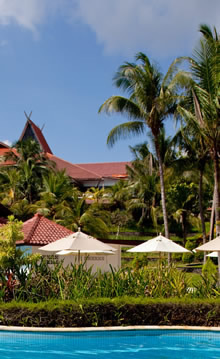 It offers a relaxing atmosphere in a natural setting with 4 swimming pools, a tennis and squash court and mini-golf. Set in Tenerife's popular Playa de las Americas, these studio apartments have private balconies or small gardens. Playa de Troya Beach is just 400 m from the Paradero II apartments.